The Cantiere Navali Falcon of Viareggio recently presented their new Falcon 80' a modern yacht featuring a spacious fly on which astern there is accommodation for the tender, an open-air saloon with sofa and table, portable bar, sundeck and bridge on the port side. The main deck includes: saloon with crescent-shaped sofa on the port side with coffee table, dining area, galley and indoor bridge with small sofa and table. On the lower deck, aft of the mainsail area, there is a spacious full-width owner's cabin with en-suite bathroom, two double cabins with twin beds and en-suite bathrooms, a full-width double cabin with double bed, en-suite bathroom and lots of space. The crew's quarters are at the bow end with private access and independent facilities. The stern of the Falcon 80' features a spacious swimming platform, easily accessible from the cockpit through two ladders on the side, and lined in teak like the whole deck. 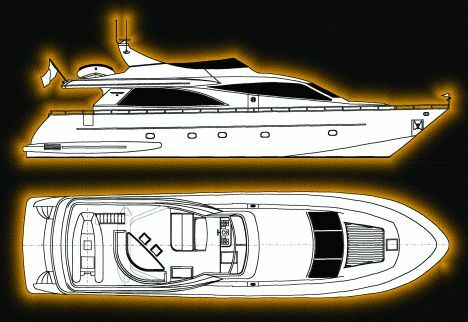 For further information please contact Cantieri Navali Falcon; via Paladini 58/A; 55049 Viareggio (LU); tel. 0584 384946; fax 0584 387880; e-mail cnfalcon@falconyachts.com; web-site www.falconyachts.com.